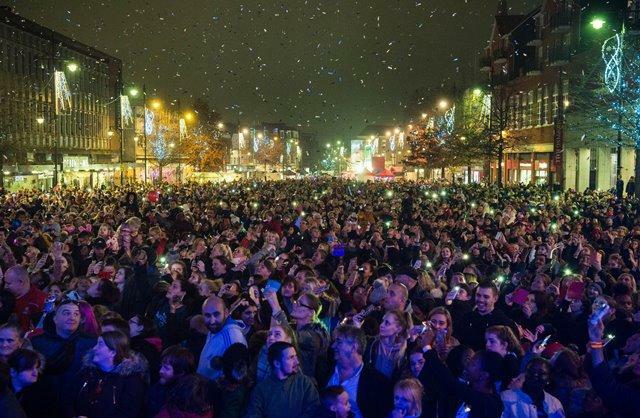 There were fireworks after the Mayor of Havering, Councillor Dilip Patel, took to the stage to greet the thousands of people who packed Romford’s Market Place to celebrate the switching-on of the town’s Christmas lights and the start of Havering Council’s seasonal festivities. A festive line-up of entertainment, which included Reggie and Bollie, the 2015 X Factor finalists, local acts James Smith and Charlotte Ambrose, and children’s cartoon characters provided by the Lightnin’ Drama Group from Rainham, entertained the huge crowd last Thursday (15 November) before the Mayor took hold of the plunger to switch on the brand new Christmas lights adorning lamp columns throughout the town centre. Following the lights switch-on all those gathered enjoyed a spectacular firework finale display sponsored by Time 107.5FM and Everyone Active. On Saturday (17 November) it was the turn of Hornchurch to get into the festive spirit with their traditional Christmas Cracker. Run throughout the day the family entertainment included Santa’s Grotto, characters from the Queen’s Theatre pantomime Jack and the Beanstalk, street entertainers, a choir, and children’s crafts. In a busy week the Mayor, Councillor Dilip Patel, switched on Hornchurch’s Christmas tree lights to conclude the day’s events. Christmas lights have now been switched on at locations across the borough including, Upminster and Rainham Village. The next Christmas event planned is the Upminster Elf Trail that takes place this Thursday (22 November) between 4pm and 6pm. This will be followed by the the Harold Hill Christmas event on Thursday 29 November from 4 – 7.30pm and the traditional Rainham Village Christmas Fayre, held this year on Saturday 1 December starting at 10am. For details of all the seasonal events around Havering go to: www.havering.gov.uk/christmas.